Trey Mourning had the best 2o minutes of his Georgetown career in the first half of the Hoyas win over Campbell. 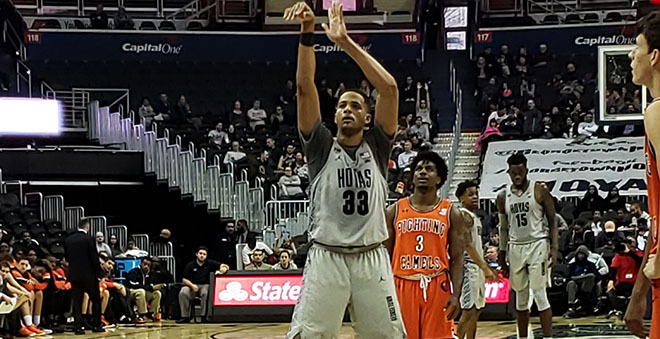 The son of former Georgetown great, Alonzo Mourning, had 13 points, 7 rebounds in the first half of Georgetown’s 93-85 victory Campbell. Mourning would end the game with career highs in points (27) and rebounds (12). When asked how special it was to do it in front of his Dad, Mourning said “It’s pretty cool. It’s definitely pretty cool”. What was even more cool, was the Hoyas walked away with a hard fought victory. Big South Preseason Player of the Year and the nation’s leading scorer, Chris Clemons led the Fighting Camels with 45 points. The 5′ 9″ senior went 16-28 including 9-19 from the three point line. He would score 27 of his 45 points in the second half. Despite the number of points, Coach Patrick Ewing thought they did a decent job on him. “I thought our guys, for the most part, made his work”, said Ewing. In a season where the freshmen in the program has gotten a lot of hype, it was the 5th year senior’s turn the be in the spotlight. It was especially gratifying considering that Mourning missed all of last season due to injury. “Last year he sat and watched because he was hurt. This year he’s able to come out and play and do the things that we saw. He has the ability to shoot the ball. He has the ability to rebound the ball. And he did that for us today,” said Ewing. The Hoyas led by as many as 16 in the first half. With 2:16 left in the half, Campbell cut the lead to 6 on a Clemons dunk. The Hoyas would respond with an 8-0 run to end the half. Freshman James Akinjo had five of the eight during the closing run. In the second half, the Hoyas jumped out to a 22 point lead before the Camels came storming back. With 2:59 left, the visitors had cut the lead to 9 points. The Hoyas would respond. Akinjo used an in-and-out dribble to get a layup plus the foul. A Clemons jumper got it down to 10. Then Clemons would hit a three to get it down to 7 w/ 1:16 left. Four Hoyas would score in double digits. Along with Mourning, Akinjo scored 17, Jessie Govan had 13, and Josh LeBlanc had 11.